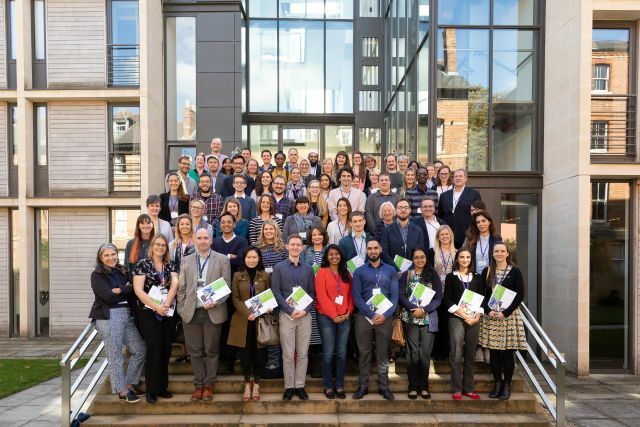 September saw health service researchers and practitioners from around the country come together at St Anne’s College, Oxford for the 2018 School for Primary Care Research (SPCR) trainee event. This two-day conference offers SPCR researchers the opportunity to (re)connect with similarly funded colleagues, bounce around ideas, and chat about their research in a supportive environment. This year, I met the criteria for both ‘first-time attendee’ and also ‘elevator-pitch presenter’. Prior to attending the event questions such as “What will the atmosphere be like? Who are the audience and other attendees’? What makes the elevator pitch-perfect? And which talks shall I attend?” abounded. Now with the benefit of hindsight, here are some of my reflections on what would be an inspiring and valuable couple of days. The first morning kicked off with a speech by Prof Richard Hobbs (Director of SPCR). Everything from publications in prestigious journals to wedding announcements were discussed in this session (successful collaboration is an important theme over the two-days!). For newbies like me, this talk really set the tone for the event. The combination of genuine praise with the supplement of gentle banter helped to create a warm and friendly atmosphere which hovered over the conference. Quickly after the talk, we were ushered into the lobby for the icebreaker. Our picks were personalised business cards (with our name and contact details). 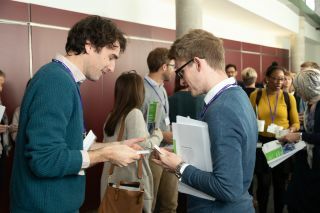 We were instructed to chat with researchers from other institutions and exchange cards in a ‘speed-networking’ format. For many of us, this proved to be an opportune moment to a) warm-up our elevator pitching muscles b) extend our circle of conference buddies. The first workshop I attended was “Using Social Media”, which was co-delivered by Dan Richards-Doran and current SPCR trainee Charlotte Albury. Dan spoke about heuristics for using social media and Charlotte shared her experience of communicating about her research via twitter. Both talks were excellent and packed full of useful and practical tips. Prior to the talk, I tended to use twitter absentmindedly and almost exclusively as an affirmation machine whose principle function was to produce gold stars (‘likes’ were formally ‘favourites’ which were literally gold stars!). Yet the speakers did an excellent job of illustrating that social media can be a powerful communicative tool and an asset to your research. And importantly that it requires some work – schedule your tweets, connect with interest groups, add photos. As someone who tends to find the process of grant writing fairly daunting, I was pleased to see that applying for research funding was a strong theme of the conference. 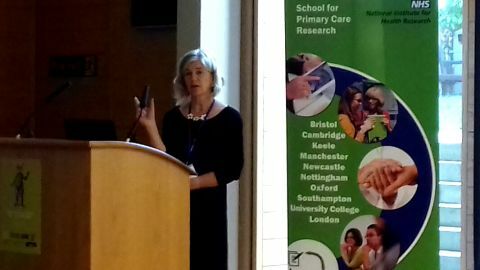 On the afternoon of the first day, I went to Prof Sue Ziebland’s talk on NIHR Research for Patient Benefit (RfPB). Without hyperbole, this was one of the most engaging and well-delivered talks I have ever attended. Prof Ziebland not only made the process of grant applications seem eminently doable, but also put the starting point and how to respond to feedback firmly in view. Prof Stephen Weng additionally had some excellent advice for orientating yourself to the grant writing process. This was rather simple but effective – ask your PI or supervisory team whether you can help out with some of the menial tasks (e.g. proofing, formatting, references). Useful suggestions like these were sprinkled throughout each presentation. One of the real highlights of the event was hearing established researchers talk about their journey through academia. Personal stories from Prof Stephen Weng and Prof Ashley Adamson (below) stressed that there isn’t one ‘right way’ to make a career in academia. Importantly, both speakers did an excellent job of emphasising that life is what happens to you while you’re busy writing papers and proposals (to badly plagiarise John Lennon). This welcome injection of perspective seemed to resonate with many of us in the audience. Prof Carl Heneghan gave a powerful and authoritative talk on ‘maximising your research outputs’. This presentation was certainly true to its title. As such, there was a strong emphasis on building symbiotic networks of collaborators, managing your time effectively, and being playful with ideas. Yet, perhaps the most memorable moment was when he stopped to ask us the question – “What is it that you do?”. The sheepish silence was elucidatory. This was, somewhat unsurprisingly, followed by an appeal for professional clarity. Overall, this talk had a rousing and motivating texture, which can still be felt weeks later. 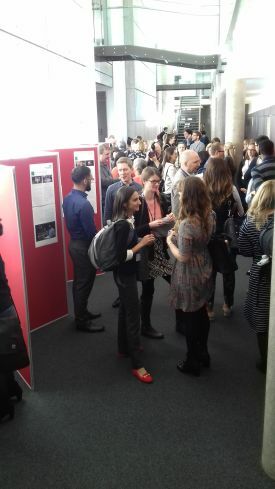 A unique feature of the SPCR Trainee event is the delivery of current research projects. Rather than the typical 10-15-minute PowerPoint with 5 minutes for questions, the presentations are short ‘elevator pitches’. For anyone who isn’t familiar with the concept, an ‘elevator pitch’ it’s a really neat and challenging idea. You have 3 minutes (and as many slides) to communicate the value of your research. In keeping with the triune theme, three groups presented in three parallel sessions. If you’re a newbie to the SPCR family, you might find this a daunting prospect (as I did). Luckily, Nadine Mizra wrote a wonderful piece on preparing for the pitch and I would highly recommend this to any first-timers. Additionally, I would also stress that it is not an issue if you don’t have results at the end of your first year. Doctoral projects come in different shapes and sizes and presenting on the aims of your PhD is absolutely fine! The atmosphere is one of sincere curiosity and kindness, so try and frame it as an exciting opportunity to discuss your research with a group of intelligent and curious people! As I got the bus back from Oxford two thoughts stuck out. Firstly, what a privilege it is to be part of such a diverse network of researchers, who prize curiosity, evidence and communication. Secondly, it can be sometimes difficult to identify the thread which runs through an interdisciplinary area such as Primary Care. We come from diverse professional backgrounds, use different methods, and sometimes operate in different epistemological frameworks. Yet I think it is this diversity that will be crucial for addressing the health service problems of today and tomorrow. View the photographs from the event.